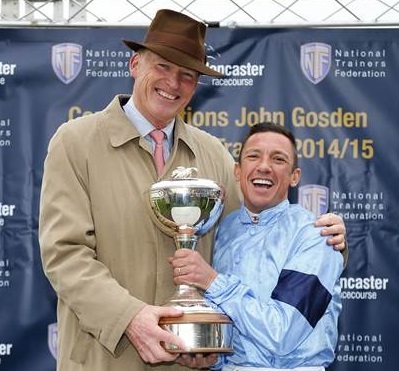 John Gosden was joined by Frankie Dettori when he was crowned champion trainer for the 2014-15 season. (Pic: Courtesy of Great British Racing). John Gosden was crowned British Champion Flat trainer for the 2014-15 season at a presentation at Doncaster Racecourse on Saturday. Gosden has won £5.2million in prize money this season, in a campaign highlighted by the victories of Golden Horn in the Investec Derby and Prix de l’Arc de Triomphe. The Newmarket handler is currently more than £1.5million clear of his nearest rival, Richard Fahey, with two weeks of the current season that ends on November 7 remaining. The trophy presentation was originally scheduled to be made at the official end of the 12 month flat season, but as Gosden – who has an unassailable lead in the championship – was not available that day, the presentation was brought forward two weeks. Gosden, who was winning the title for the second time in four years, having returned to the UK to train in 1989 after a successful stint in America, was quick to pay tribute to his owners and staff. Gosden seeks to add another high-profile victory to his tremendous season by winning the (US) $3million Longines Breeders’ Cup Turf with Golden Horn in Kentucky next Saturday (October 31). The son of Cape Cross worked at Newmarket on Wednesday ahead of his flight to America for the one mile and four furlong contest, where he is clear favourite at 1-2 from Aidan O’Brien’s Found (4-1). “Golden Horn worked this morning and we were happy with how he worked. He worked on the long gallop and Frankie Dettori was pleased with him,” Gosden said after the exercise. “The plan is for him to head out on Saturday [October 24], all being well. He has held his condition extremely well. He put the weight back on to what he was before the Arc five days after the race. Gosden’s comments precede news today that Golden Horn has arrived in America, where he is currently stabled in a quarantine barn in Keeneland, Kentucky. Reports from America suggest that his first expected day of training in the USA will be Tuesday, October 27.